Friday 22nd. 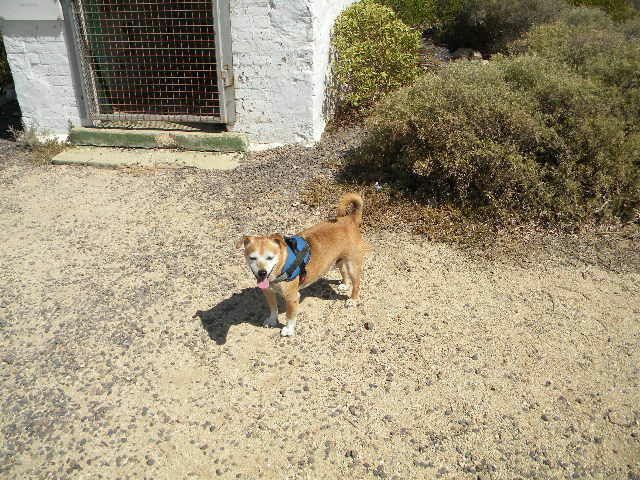 Just after lunch I put a blanket over the front seat in the car, strapped Benji in and off we went to the Lighthouse. It was a lovely day, warm but not hot, so it was a comfortable ride for the 24 miles. Of course, with the air conditioner on it would have been a comfortable ride anyway, but he did what he usually does, curl up facing me and have a nap. We spent some time wandering about and it was good for us to be out and about again after all the hot weather we have had recently. water going into the system, this, plus the water going out to water the trees, lawns and plants has really taken its toll. Having said that, it did rain for a bit last night and although it rained for several hours, it was fairly light rain and didn’t make a lot of difference to anything. 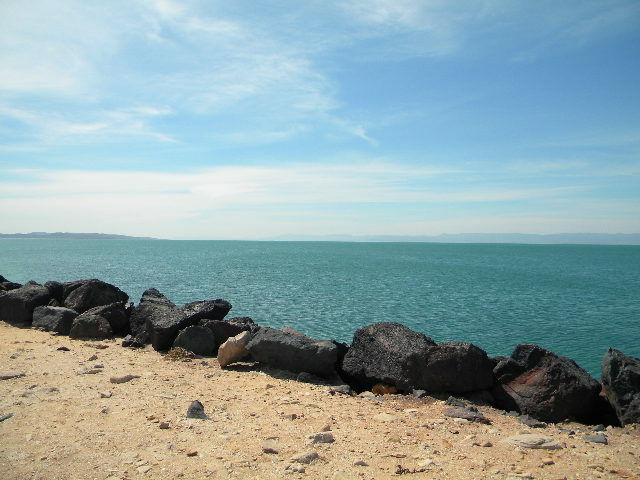 The Spencer Gulf at the Lighthouse. The drought continues to bite in the north of South Australia and over in Victoria. There has also been high and strong winds that have turned the bare paddocks into dust bowls and animals are starting to perish for lack of food and water and the dust that gets everywhere – into the animal eyes and mouth. There’s not a lot of help being handed out. Must have looked away for a moment and when I looked back, March is just about finished and we are rushing towards April. Today – Thursday 28th – Dougal is coming to stay for a little while. I have no idea how long this time as Ina is still in a Respite Center outside of Adelaide. Under our system, you can qualify for traveling assistance if you have to travel for treatment. The hospital at the Port does not have Nuclear Medicine facilities – our hospital does. So this lady had to travel from Port Augusta to Whyalla for treatment – a distance of 80 klms. ( 160kms round trip) She does not quality for assistance because the cut off point is 100 klms. This lady is traveling 160 klms twice a week for treatment but does not receive assistance. This was highlighted with the Minister for Health and he agrees that many of the rules were made to apply to Adelaide not the country areas. He has promised to have a look and overhaul where necessary. Fingers crossed there is a revision to the distance rule on assistance. I hope rainwater arrives soon.